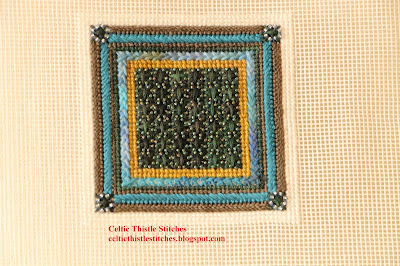 Celtic Thistle Stitches: Making an exhibition of myself! I have, however, finished and handed over my piece for the forthcoming Capability Brown exhibition to be held at Wallington , a National Trust property in Northumberland near to where Lancelot 'Capability' Brown, the celebrated landscape gardener was born. The exhibition is organised in conjunction with the Northumberland Embroiderers Guild to celebrate the 300th Anniversary of Brown's birth, and is part of a nationwide celebration that includes dance and theatre productions as well as displays of stitch and textile art at venues that have a link to Capability Brown's work. In my local EG branch, we were invited to create an exhibition piece to be displayed on an A4 canvas that depicted an aspect of Brown's work or legacy. Having visited Wallington on numerous occasions I hunted through my photos for inspiration and finally settled on this image taken on a walk in the grounds on a winter day. 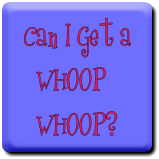 Inspired by an EG workshop with Beryl Frank, I uploaded this image and another from the walk to Spoonflower and with a bit of tweaking ended up with these two fabrics. The aim was to use the Spoonflower fabric as a frame for a canvaswork insert. So, armed with some graph paper and colouring pencils the design for the canvas was born. Of course, I couldn't resist incorporating some gorgeous hand-dyed threads from 21st Century Yarns and a sprinkling of seed beads! Put that all together and you end up with this. 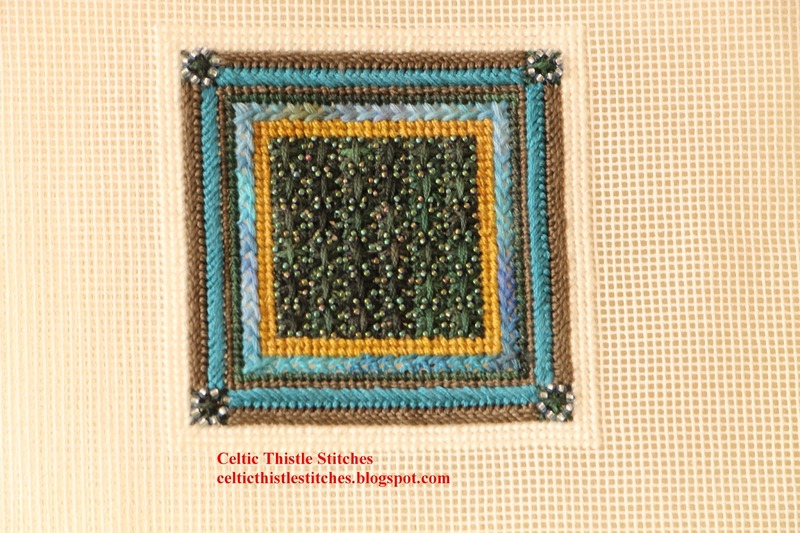 If you are in the UK, but Northumberland is a bit too far away, do check out the other exhibition venues around the country here there will be lots of wonderful examples of stitch and textile art to inspire you I am sure. I love this - it's such a great idea and it's so effective. That is a beautiful piece of work Fiona, I love the idea behind the construction. 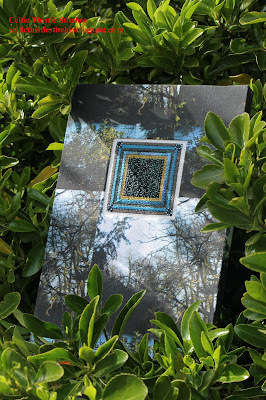 I love the use of the seed beads on the stitching, Fiona. 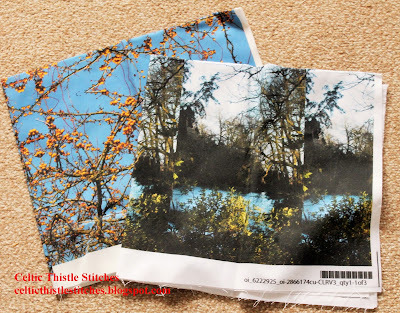 What a great idea to create fabric from a photo of the garden. WOW! This is so creative and what a stunning piece of work. That is lovely Fiona. I will definitely list the exhibition at Wellington Hall and look forward to seeing your entry. Ho, Ho, Ho'ing all the way home!